The 3 best night views, the 100 lanscapes of Japan, the 100 waterfalls of Japan. It isn't just limited to tourist locations either with the 100 famous waka poems and the 100 soundscapes of Japan. The “100 Famous Mountains of Japan” or 日本百名山 (Nihon Hyakumeizan) are a list of mountains compiled in 1964 by a mountaineer known as Kyuya Fukada. The list was then popularised by Crown Prince Naruhito. The mountains in the list were chosen for their grace, history and individuality and almost all of them are over 1500 meters tall. One of the activities we enjoy when travelling is hiking and if possible we have tried to include a couple of mountains or other walks each trip. Deciding what mountain is worth climbing is quite challenging so this list is very helpful! 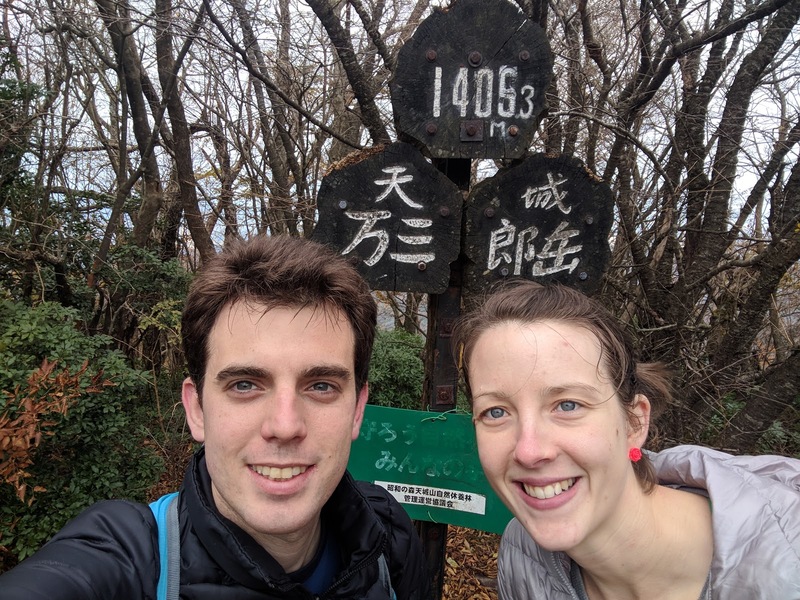 We decided that it would be a great long term goal to try and climb all of the 100 famous mountains (hyakumeizan). This page will be a list of the hyakumeizan we have climbed. I don't think we even knew about the 100 famous mountains when we climbed this. 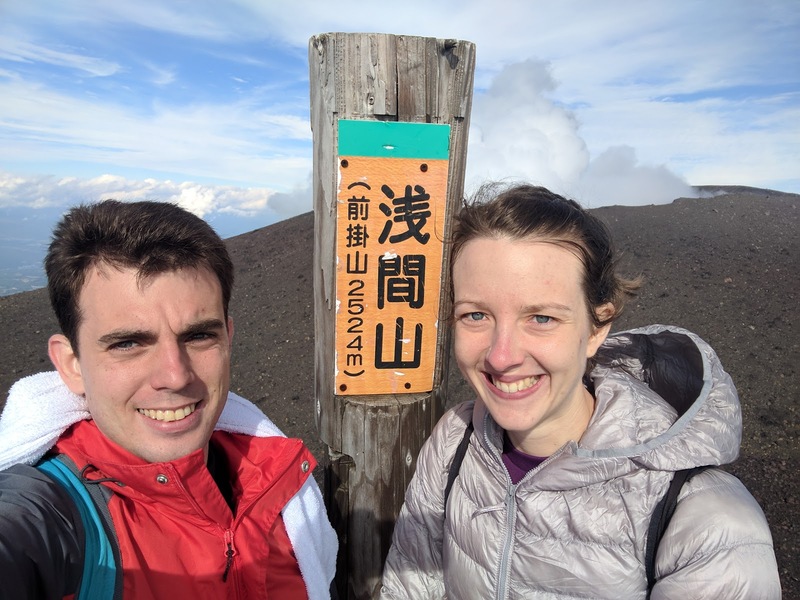 Apart from being our first of the hyakumeizan it was also the first proper mountain we climbed in Japan. It also happens to be the highest point of Kyushu. We climbed up the Mt Kuju peak, Naka-Dake is a few metres higher. The area is really nice with lots of peaks, ridges and volcanic lakes. Japan's most famous and highest mountain. 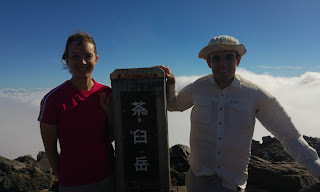 The most standard way to climb Mt Fuji is to stay overnight in one of the huts near the top and then see the sunrise. We didn't want to lose any sleep so we did it as a day trip from Tokyo. Unfortunately once we got to the top of the mountain we could not see anything as it was completely cloudy. This is the tallest mountain in Shikoku and indeed all of western Japan. It is also one of the 7 most holy mountains with a large shrine at the bottom and lots of pilgrims. 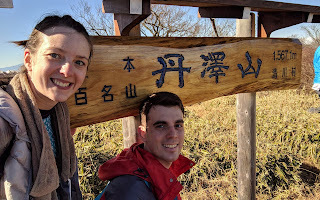 The name in Japanese means iron hammer and it is very pointy, with some steep sections where you can pull yourself up 68m high cliffs using iron chains (though you can also just walk around these sections too). There are actually three mountains called Mt Tsurugi in Japan. One is in Hokkaido and isn't very tall, but the other two are 100 famous mountains. Tsurugi-dake (剱岳) in the northern alps, and is known for being one of most difficult mountains to climb in Japan. The one we climbed this time is Tsurugi-san (剣山) and it's probably one of the easiest to climb. We actually got a chairlift up and only hiked for an hour or so! Even if we skipped the chairlift it wouldn't have been much more difficult so we have counted this one. This mountain is one of the shortest of the 100 famous mountains, but it is quite massive looking and can be seen from the Tokaido Shinkansen. This was the first mountain we climbed after deciding to focus on the 100 famous mountains. 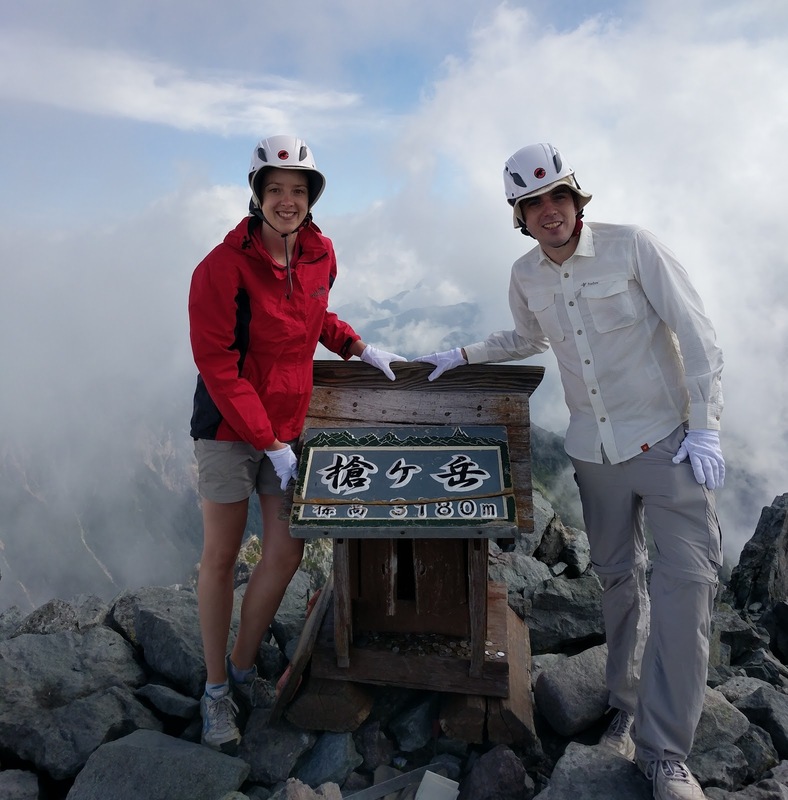 We picked this mountain as we were visiting Japan in April and it was one of the few that were already open for climbing. Even so we did encounter a little bit of snow. Another mountain that we hiked during our April trip to Japan. Apparently it can be climbed year round, though it can get quite icy. I wouldn't attempt it though especially if there's lots of snowfall, which can happen sometimes. Some parts of the trail are pretty narrow. The top is a little rocky and there are some sections with chains. 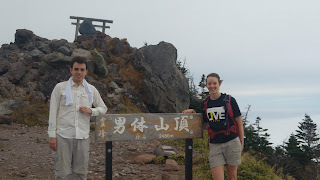 From the summit you can see the top two highest peaks of Japan. Mt Fuji and Mt Kita. Japan's deadliest mountain. Most deaths are due to people falling while rock climbing or hiking of route during winter. The main route is not too difficult and thousands of people do it every year. 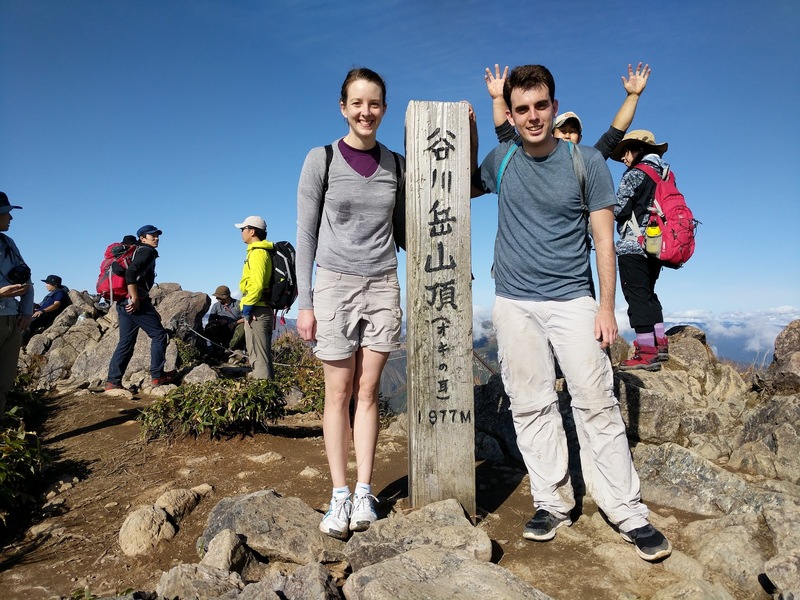 This was the first mountain we climbed after moving to Japan. When we went it was the autumn colour season and there were heaps of people. We did this as a day trip from Tokyo (using the JR Tokyo Wide Pass) so it was already a bit late in the day when we started which meant everyone else was climbing down. If this wasn't the case we probably would have not been able to do it. This is the most active volcano on the main island of Japan and is located 145km from Tokyo. Last time it erupted in 2009 the ash made it all the way to Tokyo. Due to this the path up to summit is closed as it is too dangerous. The nearby Maekake peak can be climbed sometimes but it is currently off limits too. We climbed up during a day trip from Tokyo using the JR Tokyo Wide Pass. We actually saw someone up at the peak, however it looked very unsafe as there was a lot of steam and poisonous gases billowing out the crater. This is the tallest peak of the Izu Peninsula and we went here on a day trip from Tokyo. It's not a super difficult mountain to climb and can be done pretty late or early in the season as it is not super high. I wouldn't do it Jan-March as it does get snow. We started at a golf course at the bottom and did a loop of a couple of the peaks. This is the closest mountain to where we live in Tokyo and the easiest for us to access. We only had to get one train and then a really short bus! The hike up was quite a slog though with 1559m of vertical accent and a round trip distance of 18.15km. From the top we had excellent views of Mt Fuji and Tokyo. This is the only one of the 100 famous mountains that is officially open all year round. So it's a great mountain to hike in the middle of winter. We went on the day after new year’s day. There was no snow however there were a lot of people thanks to the fact that there is a ropeway up the mountain. We were not slowed down too much though as almost everyone used the ropeway. 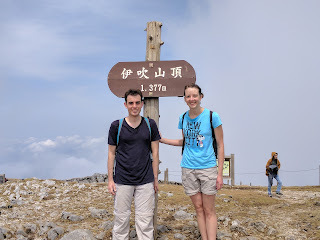 Mt Tsukuba is by far the shortest of the hyakumeizan and was a relatively quick and easy climb. Mt Daibosatsu, or Daibosatsu-rei is located on the Chuo line and like many other mountains can be done as a day trip from Tokyo. The cheapest method is to catch a train to Enzan station from which you can get to the start of the hike using a short and cheap bus. This is what we did. At the top we saw a fox! To get back to where we started we climbed down the other side then walked around the bottom to make a loop. We combined this with Mt Goryu and stayed in a mountain hut for the first time. 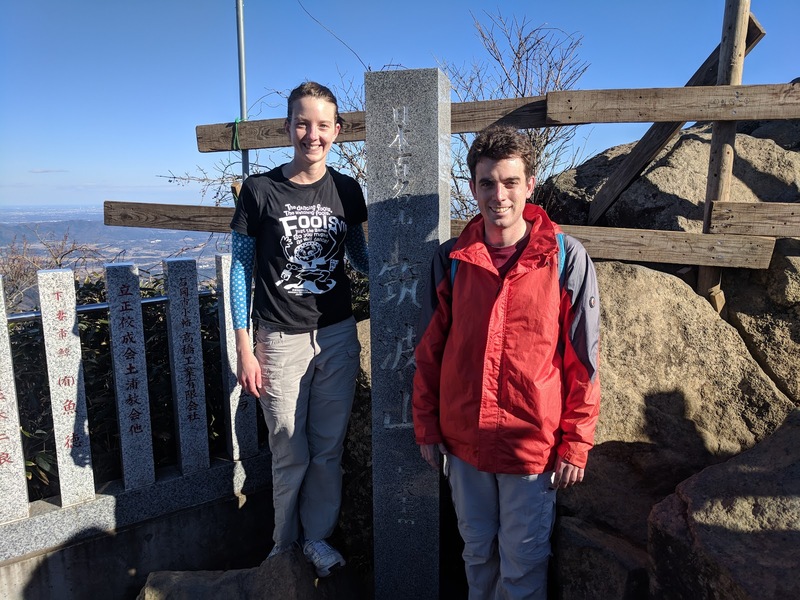 After staying in Shinano-Omachi we got a bus to Ogizawa then started the massive slog up the mountain, got to the top, then descended down an extremely steep ridge to stay at the Kiretto mountain hut. The distance was 15.61km with a personal record vertical accent of 2,252m. 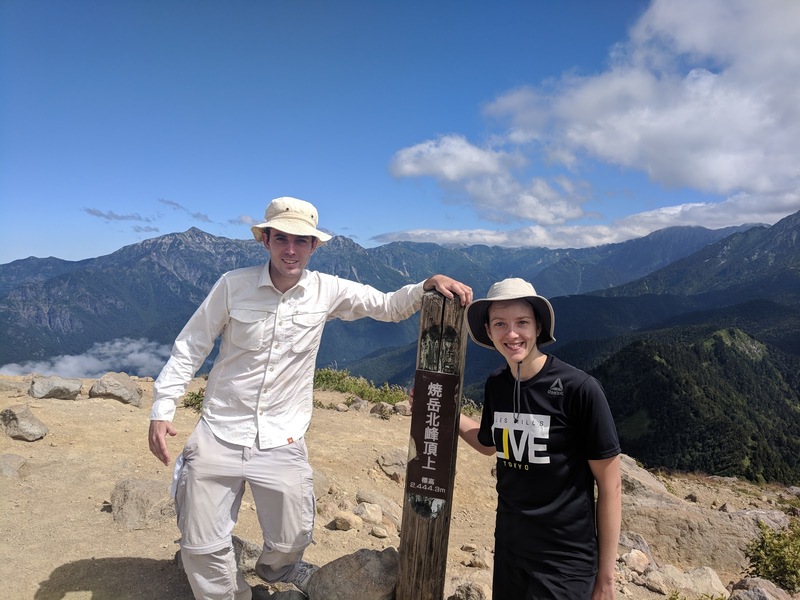 After climbing Kashimayari the previous day and spending a night in the Kiretto mountain hut we woke really early and continued along the ridge to Mt Goyruu. This path is known for being particularly steep and has been ranked as Japan's 3rd most difficult traverse (after the Daikiretto and Nishihotaka - Okuhotaka). 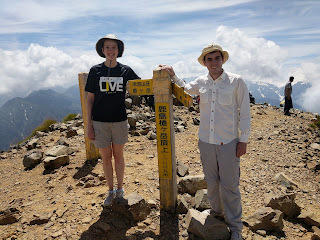 Although it was only a few kilometres it took us hours to get to the peak. Once we reached the top we walked back down the other side and returned to Tokyo. Yari means spear and it's called this because the summit of the mountain is a 100-200m tall very pointy rocky outcrop that looks like a spear. It's one of the most well known mountains in Japan and one of the tallest. Due to it's location deep in the Northen alps we again stayed overnight in a mountain hut. Instead of staying at the top though we stayed closer to the bottom only a few hours from the start of the trail at Yarisawa lodge. The next day we climbed all the way to the top then back down the other side to stay in the Shin-Hotaka onsen village. Mt Yake is the only currently active volcano in the Northern Japanese Alps and is responsible for creating Kamikochi about 14,000 years ago (by changing the course of the river). A more recent eruption in 1915 resulted in the creation of the Taisho pond at the start of Kamikochi. 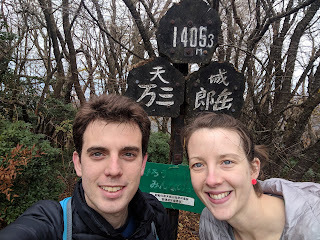 After staying in Shin-Hotaka onsen the night before (see above) we were really tired but somehow managed to climb Mt Yake. 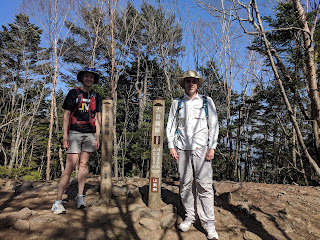 We climbed up the Shin-Hotaka and it probably the hardest I have done, partly due to the steepness, partly due to my fatigue. The crater at the top was shooting out lots of steam and gases. From the top we headed down to Naka-no-yu on the Kamikochi side and then got a bus to Matsumoto and returned to Tokyo. 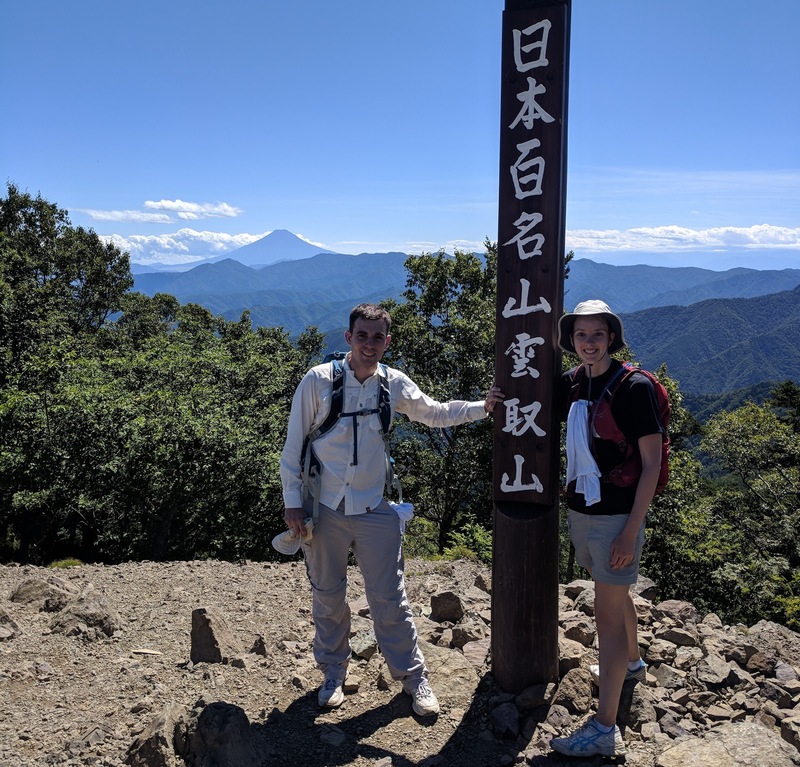 Kumotori is the only one of the 100 famous mountains located in Tokyo (just barely) and is the highest point of the prefecture. We left earlyish in the morning and caught the ome line to Okutama which is the last station. 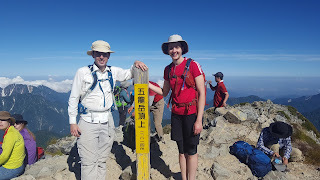 From okutama we then caught a bus another 15km to trailhead. The hike wasn't too difficult though it was fairly long at a distance of 25.6km and with a vertical accent of 1660m. We actually had to hurry a bit towards the end to make sure we got the last bus. From the top we had an excellent view of Mt Fuji. Mt Nantai is a prominent mountain located in Nikko and can be seen from the ocean (over 100km away). Nikko is well known for it's shrines and temples but is also famous due to its natural scenery and onsen. Mt Nantai is located next to Lake Chuzenji at the top of the Irohazaka slope. Just as we did in October 2017 did day trips from Tokyo using the JR Tokyo Wide Pass to climb two mountains. Mt Nantai is a holy mountain and the trail starts at Futara Shrine. At the top there is a holy sword. Mt Nasu is the volcano that heats the geothermal waters that supply Nasu onsen. We went at a really good time because when we arrived we found that the autumn colours were at their peak and the mountain was covered in a lovely mix of red, orange and green. Mt Nasu has a (expensive) ropeway but walked up from the carpark near the bottom of the ropeway. 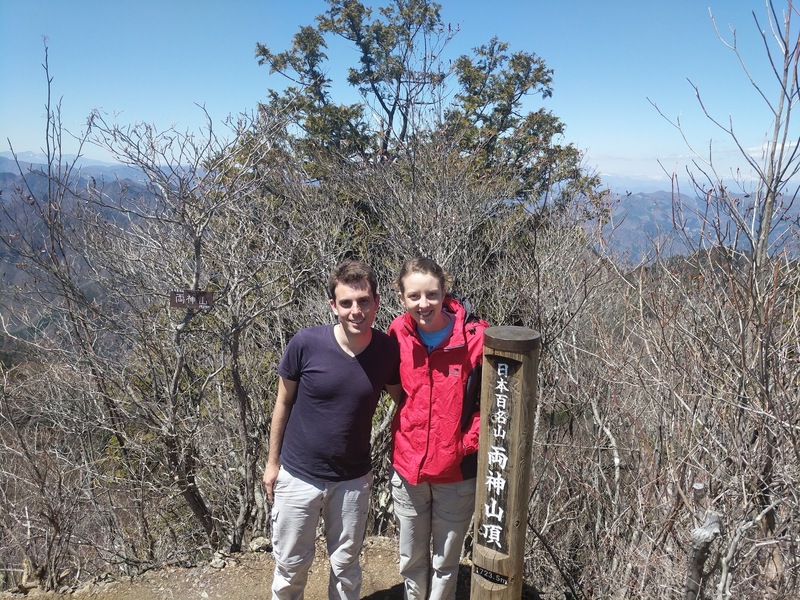 It didn't take us long to reach the Chausu peak where we did a loop of the crater. We also walked down the other side of the mountain to checkout another autumn colour spot before walking back down to the carpark.